The Boulder City Democratic Club had to cancel its September candidate night and business meeting after members say an attendee was acting aggressively toward one of the candidates. 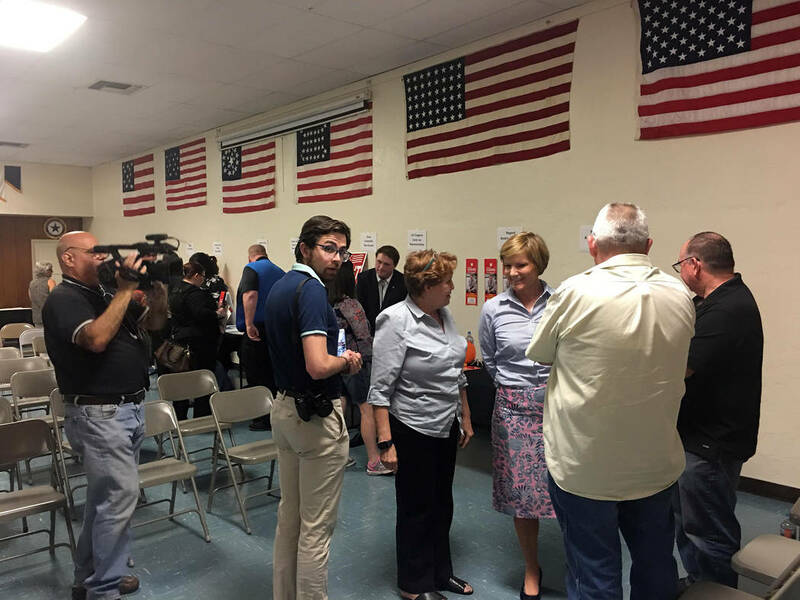 James Adams Peter Musurlian, left, records attendees and Democratic candidate Susie Lee at the Sept. 12 candidate forum hosted by the Boulder City Community Alliance at the American Legion. The incident occurred Sept. 13 at the Boulder City Library after club President Mike Hernandez asked a man, later identified by police as Peter Musurlian, not to film a presentation featuring Susie Lee, Democratic candidate for Congressional District 3. Hernandez said the request came after he learned Musurlian had been aggressive and disruptive toward Lee during the Boulder City Community Alliance’s candidate forum Sept. 12. He said he had been told Musurlian was associated with Lee’s Republican opponent, Danny Tarkanian. Musurlian asserts that he was sitting quietly at the meeting, had “no encounter with Susie Lee that night” and was bullied by club members. He said his intent was to record Lee’s comments for a 2019 documentary he is working on, ”Tarkanian: Like a Neon Sign in Vegas,” that will be produced by his one-man production company, Globalist Films. He said he has no pattern of disrupting speeches and only asked Lee tough questions after a previous appearance for an Asian-American group. Hernandez said Musurlian became aggressive in asserting his right to film Lee and even started filming people who didn’t want to be filmed. His actions became so disruptive that several club members called the Boulder City Police Department. Because the situation escalated and police and library staff had to get involved, Hernandez canceled the meeting. According to Richard Hernandez of Tarkanian’s campaign, Musurlian has no official affiliation with the campaign and is an “independent documentary filmmaker from Southern California who’s covering several races” in Nevada. James Adams said Musurlian was holding up a camera and “literally circling around” Lee during the Sept. 12 forum and at one point ripped a sign out of the hand of a person who was holding it in front of his camera.